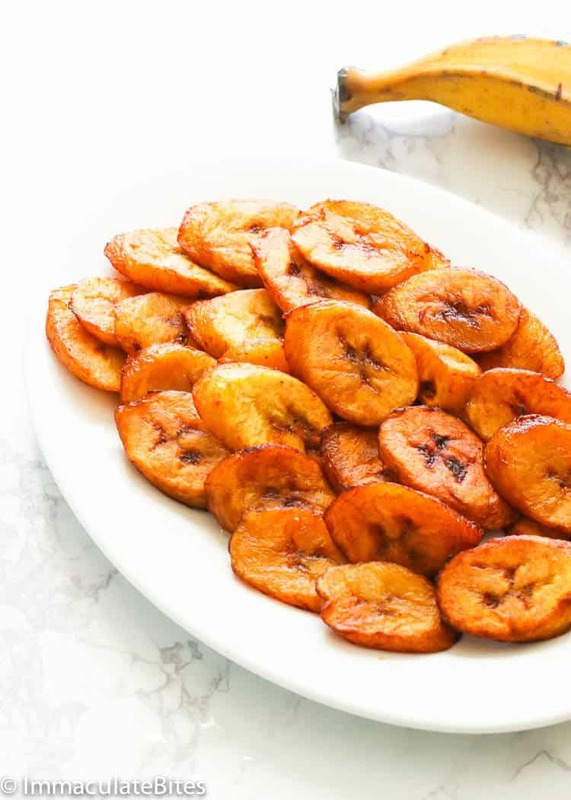 Fried Plantains – sweet ripe plantains, sliced and fried to perfection. It’s somewhat crisp on the outside and soft on the inside. 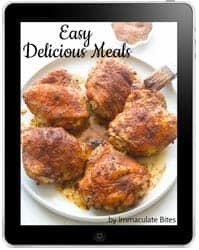 Sooo good that you can eat it as a side dish to rice & beans, stews or on its own! Amazingly delicious! This recipe here, if you’d even call it recipe, is so SIMPLE that you can make it even with your eyes closed. It doesn’t require you any added ingredients or some complicated cooking method. Yet even how pretty straightforward it is, these fried plantains always hit the spot! I grow up enjoying anything plantains. From plantain pancakes, plantain bread/cake, to plantain chips – they always have a special place in my taste buds. Plantains are widely consumed from West to East Africa and as well as the Central and South America and to the Caribbean. No wonder there are tons of ways to prepare and serve them on the table! But the simplest one is this fried plantain! We are not going to talk about chromosomes and hybrid to identify what plantain is. Plantains are also referred to as cooking bananas as they are generally used in cooking. They can be eaten ripe or unripe and generally starchy. In West Africa (and some parts of Africa), plantains are often cooked as in ingredient to a main course or as a side. 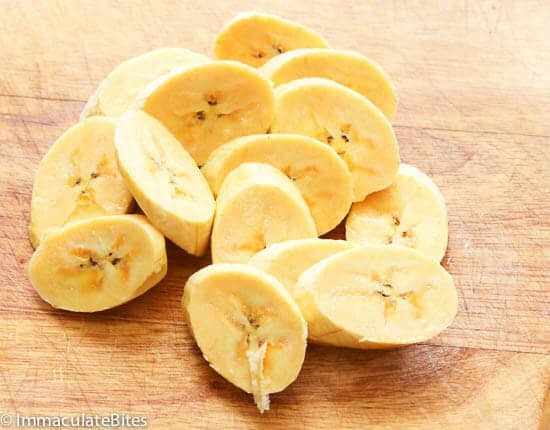 But ripe plantains can also be eaten raw since their starches are converted to sugars. Unlike bananas, plantains are bigger and longer with bright green color (which turns black as they ripen) and thicker skin. But plantains are part of the banana family. No doubt about that. However, it contains more starch and less sugar and are used as a vegetable in many savory recipes just like how potatoes are used. Thus, they are often not consumed when raw. Bananas on the other hand are traditionally eaten raw because they’re sweet. They have thinner skin and turns yellow when ripe. 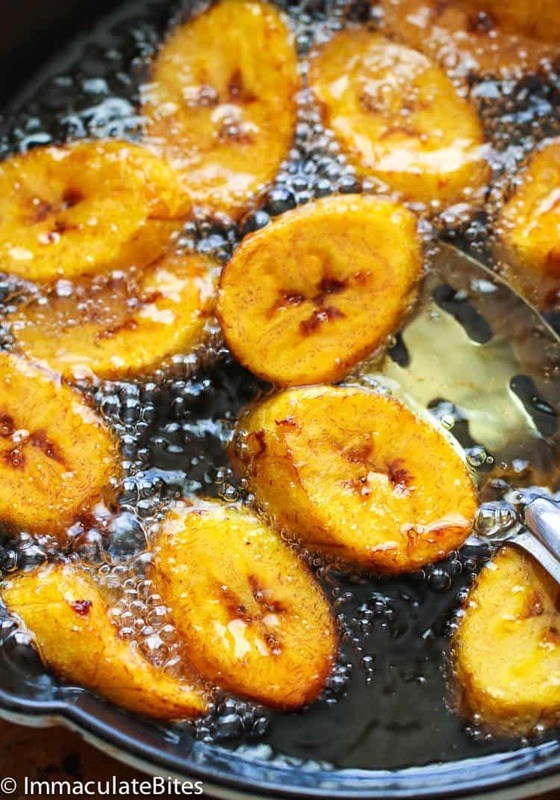 Fresh plantains though have more vitamin C, A and potassium than bananas. Are plantains healthy? Yes, they are. 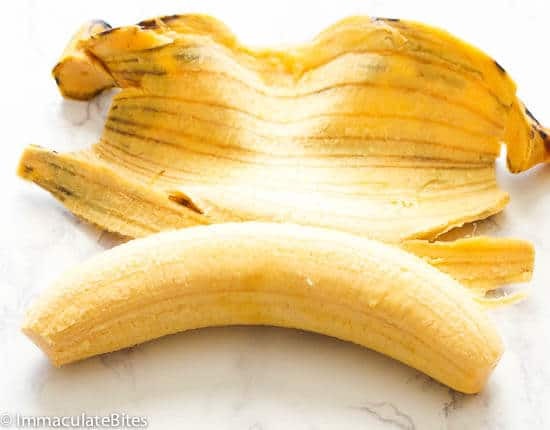 Here are some good comparison table for plantain vs. banana. Stuffed Baked Plantains – This is my top plantain post (check also the VIDEO). 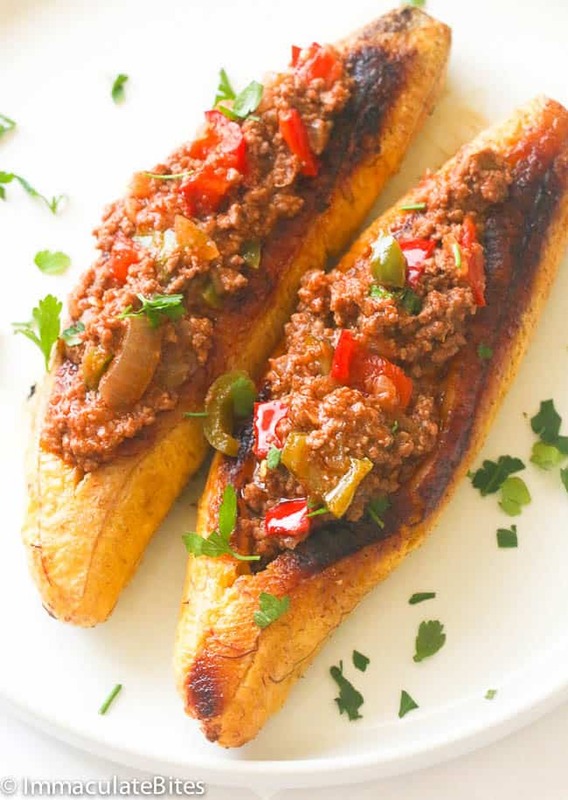 These are delicious roasted plantains filled with well-seasoned ground meat, tomatoes, onions, bell pepper and spices topped with cheese. 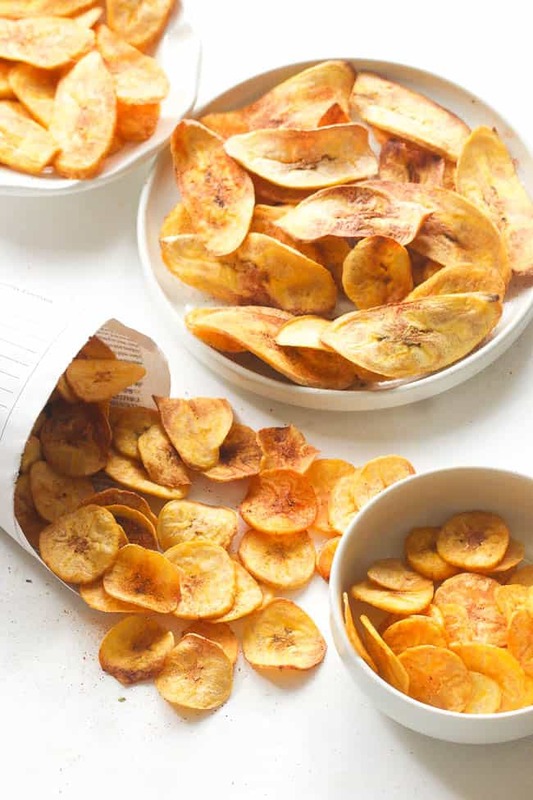 Plantain Chips – Crispy, crunchy and addictive fried/baked plantain chips paired with sweet tango mango avocado salsa for a wonderful late night snack time or as appetizers! 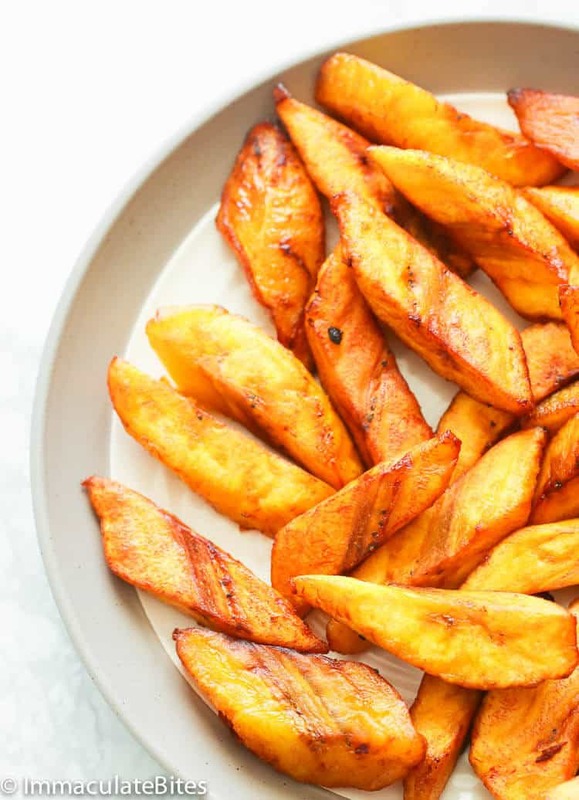 Kelewele or Aloco – A mouth-watering African spicy fried plantain recipe seasoned with cayenne peppper, ginger, lemon, nutmeg, garlic and bouillon cubes. 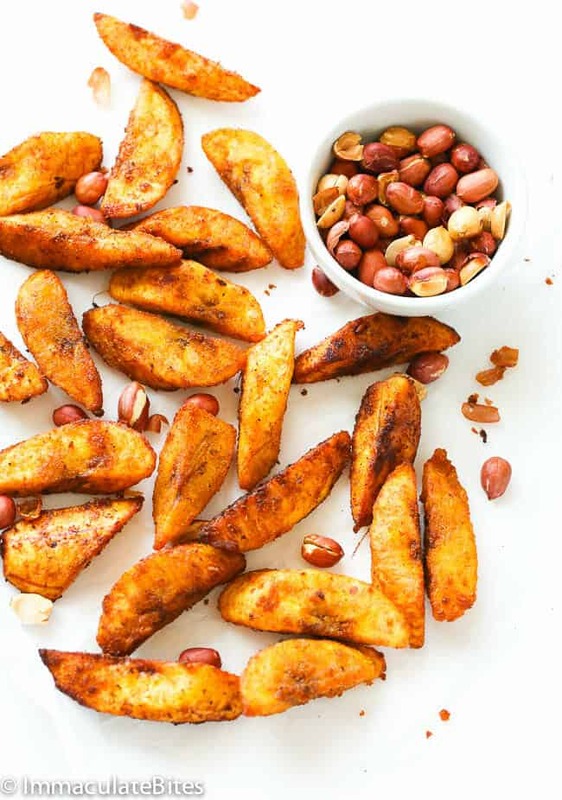 Soft, spicy, and sweet, snack that pairs well with crunchy peanuts or with any protein. Plantain Frittata – Baked Plantain Frittata aka plantain and eggs- A healthier and delicious take on fried plantains and eggs . 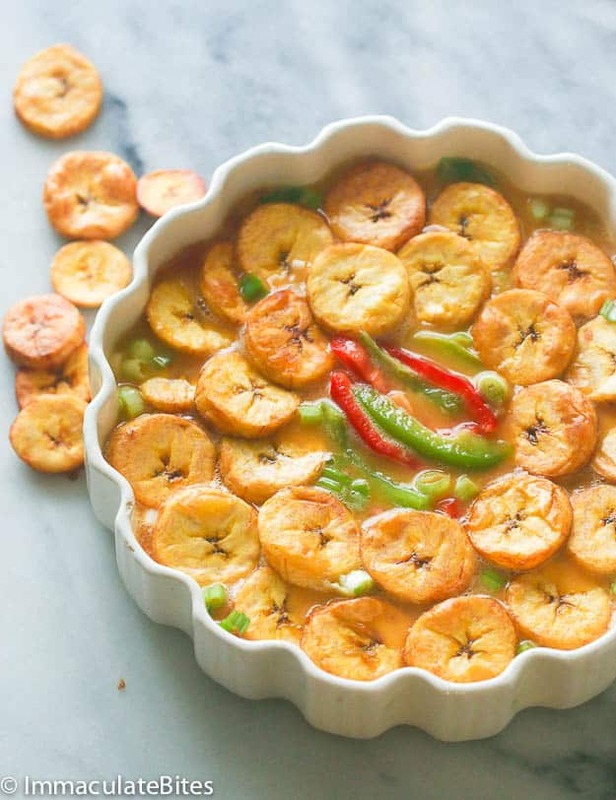 Want to check MORE scrumptious ways to enjoy plantains? Check it out HERE. Now don’t get overwhelmed. 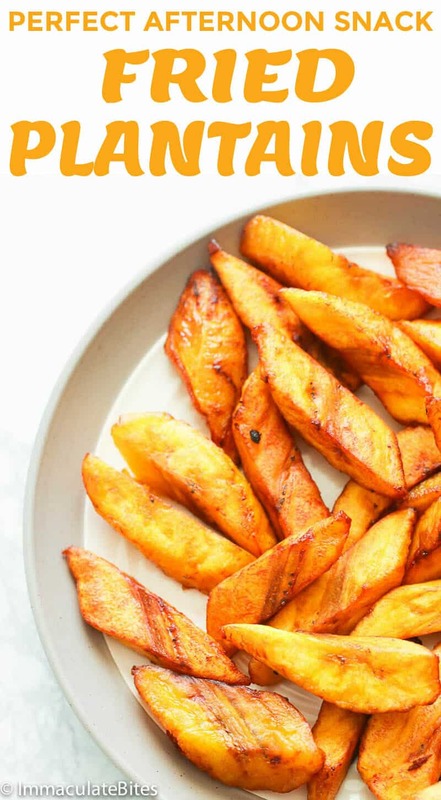 As they always say, simplicity is the best and this easy fried plantains here will always be the go-to way to enjoy plantains whether as a side to your favorite savory dish or as a snacks. 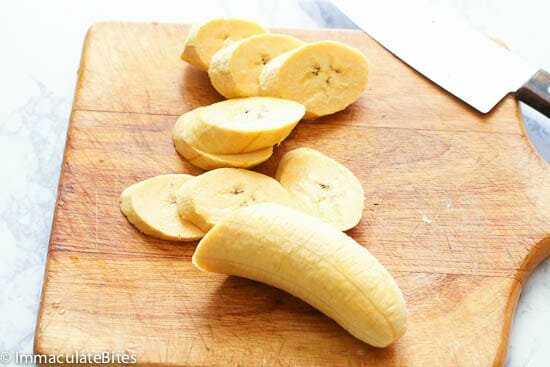 Using a sharp knife cut both ends off the plantain. This will make it easy to grab the skin of the plantains. Slit a shallow line down the long seam of the plantain. 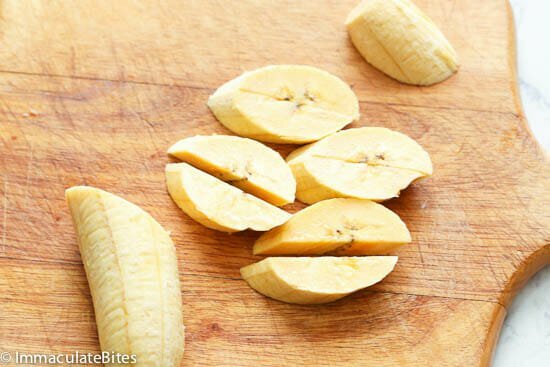 Cut plantains in diagonal pieces or medium sized slices and set aside. Heat oil in a large skillet over medium-high. Test if oil is ready by carefully trying out a slice of plantain. Oil should bubble before proceeding with the rest. If not wait another minute or two. If oil is too hot turn off gas and wait for about 2 minutes before proceeding. Fry in batches, turning once, until plantains has reached desired color (brown) about 2 –3 minutes per side. 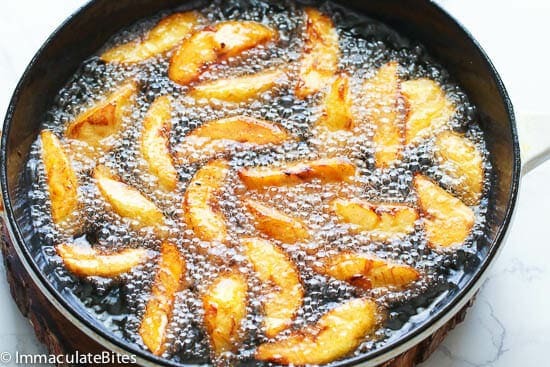 Then continue cooking, turning plantains occasionally , until soft and deep golden brown, 5–7 minutes. Carefully remove plantains with slotted spoon and transfer to a paper towel-lined plate or tray . Season with salt and/or cinnamon sugar, if desired. Serve hot. As the plantains brown, continue to add more cooking oil spray, salt and pepper (if needed) until they have reached the desired color and texture. Fry in batches, turning once, until plantains has reached desired color (brown) about 2 –3 minutes per side. 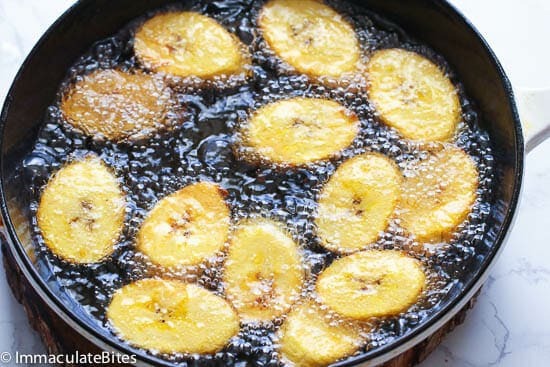 Then continue cooking, turning plantains occasionally , until soft and deep golden brown, 5–7 minutes. Carefully remove plantains with slotted spoon and transfer to a paper towel-lined plate or tray . Season with salt and/or cinnamon sugar, if desired. Serve hot. 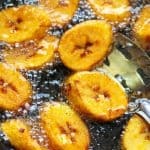 Great site, going after some plantains to coin and deep fry. Wish me luck first time was ok but with the hints I got here ill try again. Enjoy! Please do let me know how it turned out for you. Can these be made in a deep fryer? Hi Imma! I’ve wanted to let you know for the longest time that I love your recipes, the kinds of recipes you offer, the easy way you write your recipes, the photos, the whole ball of wax actually! I hadn’t had a question until this post about plantains. I first experienced these during my trip to Ecuador so I truly appreciate your very informative post here. But what is the green veggie dish, or so it appears? I’d love to know, please? Thank you! Dawn p.s. I see the shrimp and don’t eat them but I could probably substitute that for something else I’m sure. HI, Dawn. Thank you for all the kind words. I appreciate it. That green veggie dish is Stewed Spinach. 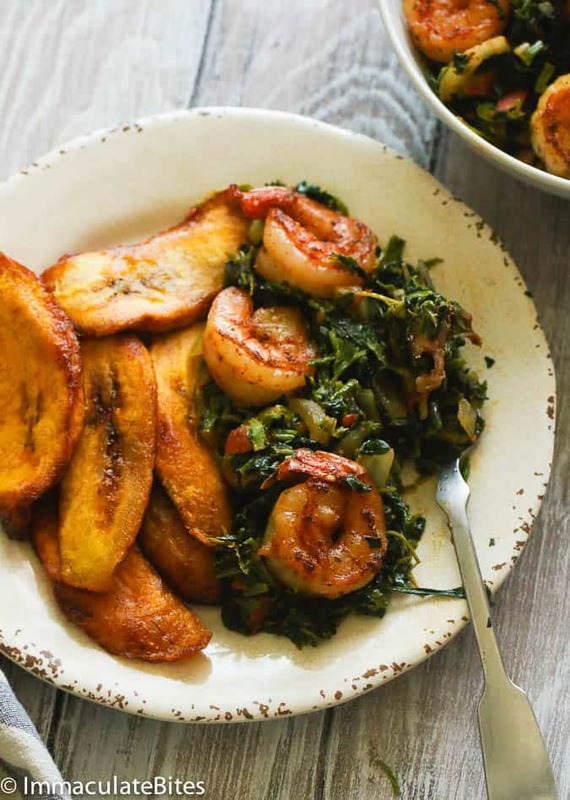 You can get the recipe here >>> https://www.africanbites.com/stewed-spinachafrican-style/ and yes, you can always replace the shrimps with your preferred protein. Happy weekend! Have learned to enjoy many uses of plantain including plantain bread/cake. But the easiest dinner for me is to fry some plantain with garlic, or ramps as I did last nite, drain the excess oil and pour a beaten egg over them in the pan for a 1 pan omelet dinner. Added some cheddar cheese as well. 10″ meal, delicious, filling and done. That sounds so delicious, Tanya! Brilliant!